It was a perfect Valentines Day for the team of Al Zobair Stud. As the evening of approaches in the gentle light of the setting sun, a phalanx of amazingly beautiful mares took up position, waiting for the announcement of the Abu Dhabi International Senior Mare Championship winners. It was pristine Pistoria's special day, accomplishing Gold for Sheikh Abdulla Bin Mohammed Ali Al Thani, proud owner of Al Zobair Stud wisely managed by Michael van den Elsken. Again the fleabitten mare was one of the main attractions of a major event. Just like in 2015, when the Gazal Al Shaqab daughter was offered in the Pride Of Poland Sale, a worthy daughter of her dam Palmira, an accomplished show horse and incredible producer, tracing back to the valuable female line of Lady Blunt's Rodania. Bred by Michalow Stud, Poland, Pistoria, herself a successful competitor in the show ring, who won some major titles, was sold for 625.000 €, the second highest price that year. The high-seller was Pepita, by Ekstern, for 1.4 Million € then. Silver was given to the Marwan Al Shaqab daughter Salwa Al Bidayer (x San Jose Alfonsina), bred and owned by Sheikh Mohammed Saoud Sultan Al Qassimi, Al Bidayer Stud. In this tough competition, AJ Aryana gained not only 93 points in her class (just like Pistoria in hers) but was also given Bronze. AJ Aryana sire is AJ Portofino and the dam is MC Alexis, proudly bred and owned by Ajman Stud. The Senior Stallions saw another exciting competition with five well-filled classes. Janow Podlaski bred Pero (Poganin x Perora) was the high scorer with 93 points and won his class easily but was not taken into consideration in the championship. Gold Champion Senior Stallion was given to Perseus K.A., bred by Knocke Arabians, Belgium, and proudly owned by Almazrouei Arabian Horse Stud. The dark chestnut Perseus K.A. is by Espressivo out of Phirouettes, linebred to QR Marc and tracing back in tail female to unforgettable Pipi – Pilarka. Dr. Ghanem Mohamed Obaid Al Hajri's SH-Hab Al Hawajer son Omear Al Hawajer (x Gharshoub Al Hawajer) accomplished Silver while S.A. Almoshaher (Al Ayal AA x FS Cayenne) received Bronze; he was bred by Ajman Stud and is owned by Reeh Al Shamal Stud. It was Ajman Stud, which celebrated a double success in the Junior Filly Championship with two bay beauties. The competition was amazing if even horses like accomplished Sundos Al Bidayer weren’t considered in the championship. 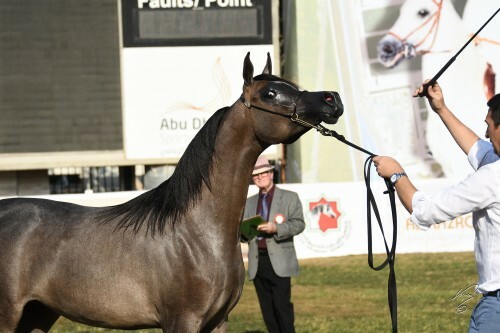 Ajman Stud’s Marwan Al Shaqab daughter AJ Saray (x Siberia SA) was the high scorer of the show with 93,13 points. In the championship AJ Saray received Gold while her stablemate AJ Tarim accomplished Silver. 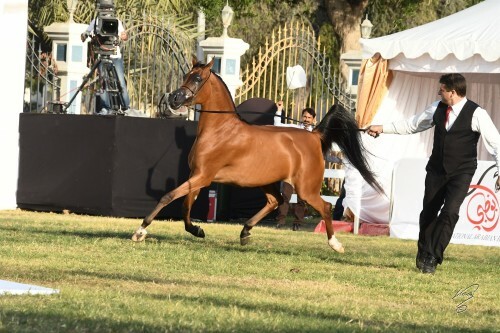 AJ Tarim is by Emerald J, so we see again the sire line of Marwan Al Shaqab, while her dam Espinilla is a valuable Al Maraam daughter and a maternal granddaughter of impeccable Emanacja. Another bay received Bronze: Eralda (Emerald J x Enezja), bred by Krzysztof Gozdzialski and owned by Al Shiraa Stables. Ajman Stud celebrated another Silver medal winner with the Yearling Filly Championship. This time with the AJ Marzan daughter AJ Banafsaj out of Princes of Marwan, making AJ Banafsaj a granddaughter of the great producer Amety B. For sure, this filly will have an amazing future. This time she was only bested by Dubai Arabian Horse Stud's D Shihanah, a daughter of FA El Rasheem out of D Shahla, who is linebred to Marwan Al Shaqab. Marwan Al Shaqab is also the maternal grandsire of Bronze winner Al Aryam Samha, bred and owned by Al Aryam Arabians. Her dam JJ Salina, by JJ Senor Magnum established a valuable family at this stud farm. 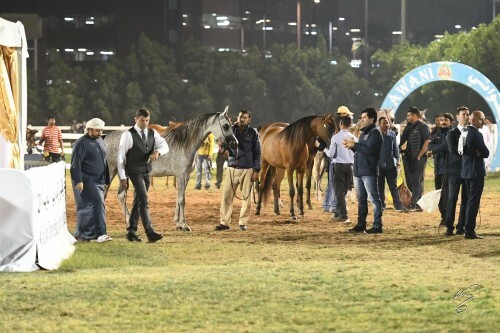 Dubai Arabian Horse Stud took another Gold at the Yearling Colts with D Mahboob (x Julianna Z). It was the third title in a row for the D Mshary son, representing the sire line of Marwan Al Shaqab. Al Zobair Stud's Cavalli son Fakhr Al Zobair (x Ammoriah Al Zobair) achieved Silver with Rami Al Bidayer (FA El Rasheem x Marami Al Bidayer) winning Bronze. Bred by Al Zobair Stud but proudly owned by Mohthab Arabian Horse Stud, the glistening white SMA Magic One son Edwan Al Zobair achieved Gold Champion Junior Colt. His dam is the WH Justice daughter Mahrisa, making Edwan Al Zobair linebred to Padrons Psyche. 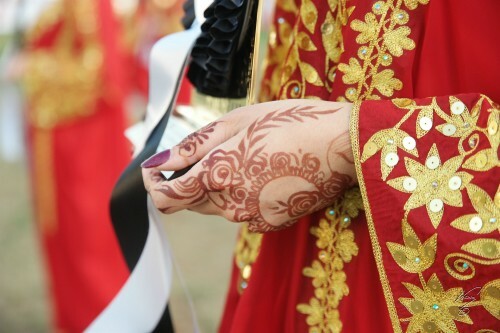 In tail female line he is tracing back to Moniet El Nefous through Mahiba. Silver was given to D Ibn Rasheem (FA El Rasheem x Angeliccah), who won Bronze at the Ajman Show recently for his breeder and owner Dubai Arabian Horse Stud. Bronze went to another FA El Rasheem son: Mahboob Al Hawajer (x Illuminate), the reigning UAE National Silver Champion Junior Colt, bred and owned by Al Hawajer Stud.